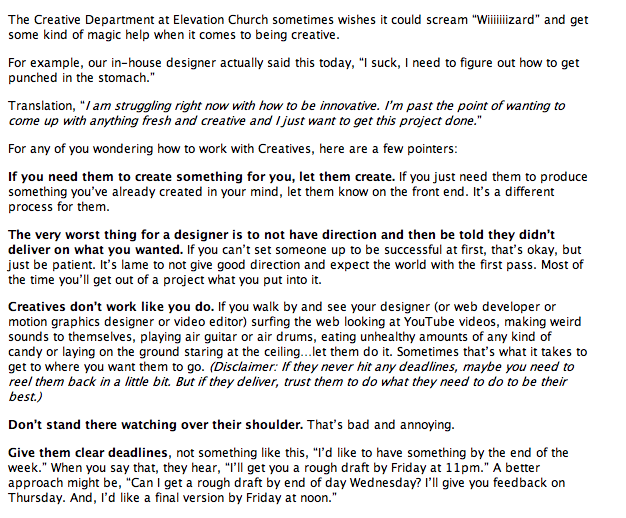 Larry Hubatka, the Creative Pastor at Elevation Church wrote a great post about creative people… read it here (due to a domain name change, the post has disappeared so I copied the whole post below). This one really got me – because I have been guilty of it! If you need them to create something for you, let them create. If you just need them to produce something you’ve already created in your mind, let them know on the front end. It’s a different process for them. The very worst thing for a designer is to not have clear direction and then be told they didn’t deliver on what you wanted. This entry was posted in Church, Leadership by chrisbellonline. Bookmark the permalink. Wow dude! Fantastic post. Thanks for putting that up on your site. Pingback: CreativeJournal.net » Blog Archive » Dealing with me. Yep, great post. Thanks for giving me fodder for Tuesday staff mtg. Found you through Twitter. Don’t you just love those social networks? You’re right – post could have been much more. Add on, brother, add on.